Scientists contribute to the vast collective knowledge on nearly every subject. Research conducted by scientists furnishes data for classroom textbooks and encyclopedias. Science is also responsible for the great advancements in technology the world has seen within the past decade. Computers are faster, airplanes are safer and the world seems smaller thanks to the work of scientists. Science is found in nearly every advanced industry. For example, in the health care sector, science is responsible for the medicines produced. Over-the-counter medication, antibiotics and prescription drugs are all products of intensive scientific research into how the body works and how certain conditions and symptoms can be alleviated. Science is also responsible for how certain physical rehabilitation techniques are performed, as well as how diagnostic tests are run. Engineering science produced the equipment that physicians use as well. In the business industry, science contributed the computer and telecom technology that companies depend on. Conference calls, long-distance communication through the telephone or Internet, and keeping electronic records can be credited to advancements in electronic science. 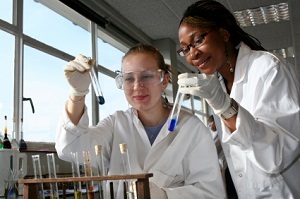 Many science fields overlap into other industries, such as engineering and technology. The ones featured here in this category are primarily research-heavy occupations. Food science is expected to steadily increase into the next decade and beyond. As the U.S. population increases, making sure that there is enough food for all Americans becomes more important than ever. Food scientists work to ensure that crop fields remain fertile and that livestock remain healthy. There are many disciplines within food science, but all of them deal with quality and safety. For people who are curious about how things work and how they can be made to perform better, science offers a rewarding career.